The Midi-Pyrénées is situated in the South of France, sharing a border along the Pyrénées mountain range with Spain. 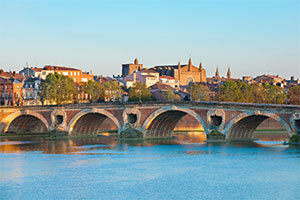 The region has on average 2,000 hours of sunshine each year making it one of the sunniest places in France. A holiday in the Midi-Pyrénées can give you a fantastic sense of variety and freedom. From the dramatic mountains of the Pyrénées to the gentle countryside of the numerous national parks, outdoor life is something special here. Take in the fresh air with hikes in every corner of the region - there’s 30,000km of designated hiking trails to choose from for all capabilities. A lot of trails are designed for either their natural appeal or to take in things of historical interest. Toulouse Enjoy a wander around Toulouse to take in the pretty pink buildings and lively atmosphere. The space museum – le Cite de l’Espace is one of the top rated places to see in the city and is particularly great for children. Pyrénées National Park If you have adventure in your blood, spending some time in the National Park is a must! The national park stretches 100km miles from east to west and is a haven for walkers. The natural surroundings truly are stunning! Millau Viaduct If you’ve got a head for heights, you’ll love the Millau Viaduct. It currently holds the world record for the tallest bridge – its 343 metres tall! The viaduct links Clermont-Ferrand with Béziers and Narbonne. There are many ways to enjoy the structure without driving over it. One of the most popular ways is to take a paddle in a canoe down the River Tarn, passing underneath the Viaduct. For fantastic views, with your feet firmly on the ground, there is a dedicated viewing area, with an information centre and a gastronomical area where you can sample food by a Michelin-starred chef. Puy du Sancy Take a cable car up to the peak to enjoy stunning views over the Massif Central Mountains. If you prefer to keep your feet on the ground, the historic Capucin funicular is the oldest funicular in France. Both the cable car and funicular take you to the foot of hiking trails, all offering fantastic views. Vulcania The Auvergne is situated to the north of the Midi Pyrénées and is known for its volcanoes. You can get up close and find out all about them at the Volcano-themed theme park, Vulcania. You can also take a tethered hot air balloon ride to enjoy the stunning volcanic views surrounding the park. Volcans d'Auvergne Natural Regional Park This park is the largest regional park in France and is fantastic for hiking, biking and exploring nature. To find your perfect campsite in the Midi-Pyrénées please use our interactive site finder, call our knowledgeable customer advice team on 01 242 1901, or go straight to the individual campsite pages.